Just fabulous for the whole family. Sophisticated and playful, delightful and fun. An easy one dish entrée that can be prepped and refrigerated ahead of time, even frozen. 1 Cup Bread Crumbs natural, flavored or plain and use your choice of herbs: oregano, basil, etc. Preheat oven. 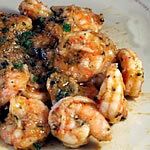 Place all shrimp in baking dish. Add next 7 ingredients and gently stir through. Add wine and water. Dot top with butter and sprinkle all with paprika. Cover with aluminum foil. Can be refrigerated for a day or frozen at this time. Bake 30+ minutes or until shrimp are pinky white. Depending on how you like your gravy, you may have to add more liquid and/or bread crumb mix for desired thickness and amount. My family likes lots of gravy so just before shrimp are done I take the dish out of the oven to countertop closing oven door, and comfortably fill up dish with more wine/water, bread crumbs and adjust seasonings. Return covered dish to oven and finish baking, about 5 minutes. Take out of oven. More seasonings can still be added while hot. Serve over rice or pasta. Deelish! Fast, easy, literally a 1,2,3 entrée. This is one dish that you’ll want to savor and serve over and over. 1/2 teaspoon Red Pepper dried crushed or more for more spice! *Options & continued adventures: Add some White wine to sauce: Sauvignon Blanc or Pinot Grigio or something very slightly fruity. You can also dredge fish fillets in white flour till thinly coated and sauté till pale tan and slightly crunchy then follow rest of recipe. About 1 teaspoon of freshly grated ginger juice adds to but does not impose on the red pepper in the sauce. This fish should melt in your mouth! Heat skillet over medium/high heat and add oil. Allow oil to heat for about 2 minutes. Sprinkle fish with salt and pepper. Add half of the whole fish fillets to skillet and allow to cook until just opaque in center, a few minutes, turning gently on each side being very careful not to break fillet apart. Transfer fish to platter. Repeat with remaining fish. In the same skillet add more oil so skillet bottom is evenly coated. Add parsley (stand back a bit while the parsley gets annoyed and spits) and crushed red pepper. Sauté 1 minute. Add tomatoes, olives and garlic and if adding wine, use about 1/4 Cup now. Continue sautéing until tomatoes are soft and juicy, about 2-3 minutes. Season sauce with salt & pepper. Spoon over fish and serve. Bellissima!